Although news reports about the IPCC may contain remarks such as, “In their latest international report, climate scientists warn that the world must cut greenhouse gas emissions to avoid disaster,” actually the role of the IPCC is only to provide policy-relevant information based on its assessment of published scientific work; it does not propose or advocate any policy. That is the job of policy-makers. One of the responses of the UK government is the Climate Change Act, which established a target for the UK to reduce its emissions by at least 80% from 1990 levels by 2050. This target is an appropriate UK contribution to global emission reductions consistent with limiting global temperature rise to as little as possible above 2°C. UK carbon dioxide emissions come from many activities which use energy. Houses consume about 30% of the total. This arises mainly from burning gas in our boilers, for central heating and hot water, and partly from electricity use. The UK housing stock is old relative to most European countries, with many houses dating from Victorian times. I’m a home-owner as well as a climate scientist, and this conjunction leads me to the conclusion that I ought to reduce my domestic carbon dioxide emissions. My house was built in 1873. It’s semi-detached, and has solid brick walls with no cavity. Over the last several years, I have been improving its energy efficiency. 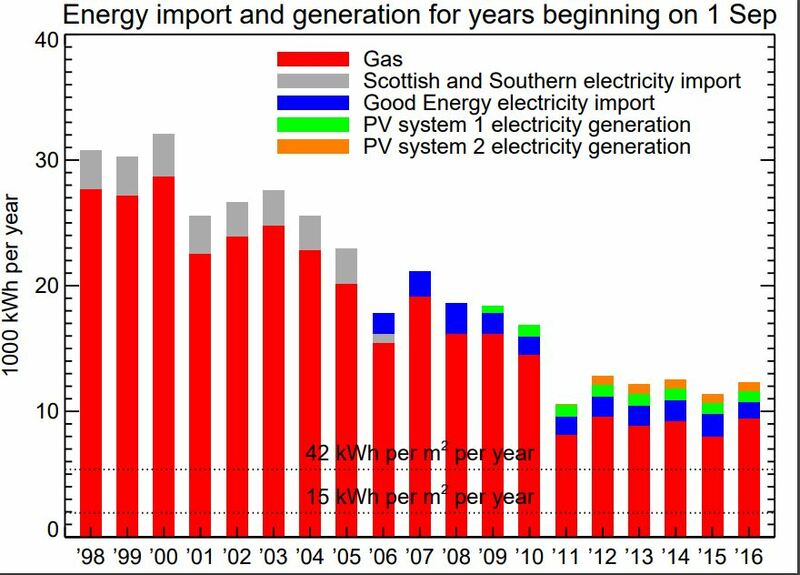 The energy “import” (from the gas and electricity mains) has fallen from about 30,000 kWh per year when I first moved in, to about 11,000 kWh per year recently (Figure 1). This has been achieved through a variety of alterations, including insulation of roofs and walls, double and triple glazing, a condensing boiler, a wood-burning stove, and more energy-efficient electrical appliances. I am impressed by the performance of my new A+++ fridge/freezer, which has a greater capacity than the two old ones I used to run put together, but uses only 13% of the energy. That’s significant, because the fridges were the largest consumer of electricity in the house. 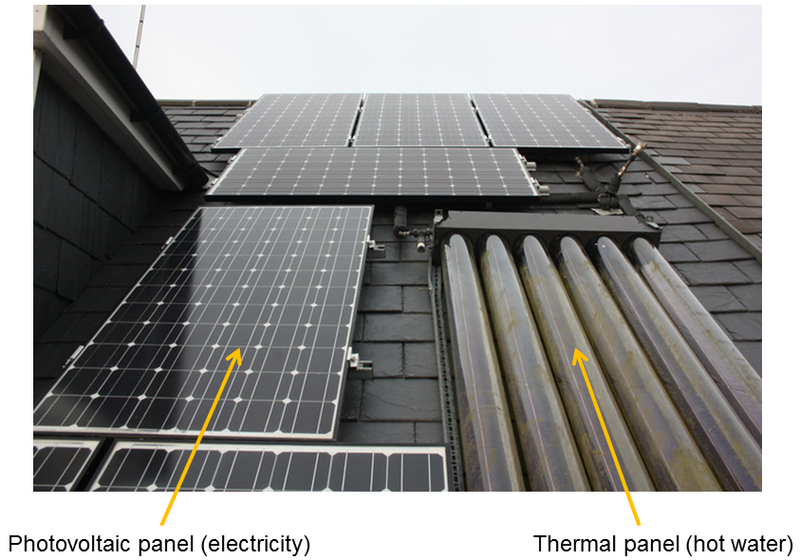 I also have solar panels installed on the roof (Figure 2). These are of two kinds. The photovoltaic (PV) panels take up more space, and generate more than a half of our annual electricity consumption. The solar thermal panel heats all the hot water we need for showers and washing-up during the summer months. The solar thermal panel is better at collecting usable energy, because the efficiency of conversion of sunlight into electricity by PV panels is quite low. The most dramatic and unusual undertaking to date has been to build a new wall on the outside of the gable-end wall of the house (Figure 3). The purpose of this was to create an insulated cavity. I decided to have it magnificently well-insulated, since the insulation itself is cheap compared with the cost of the work. I’m very pleased with it. 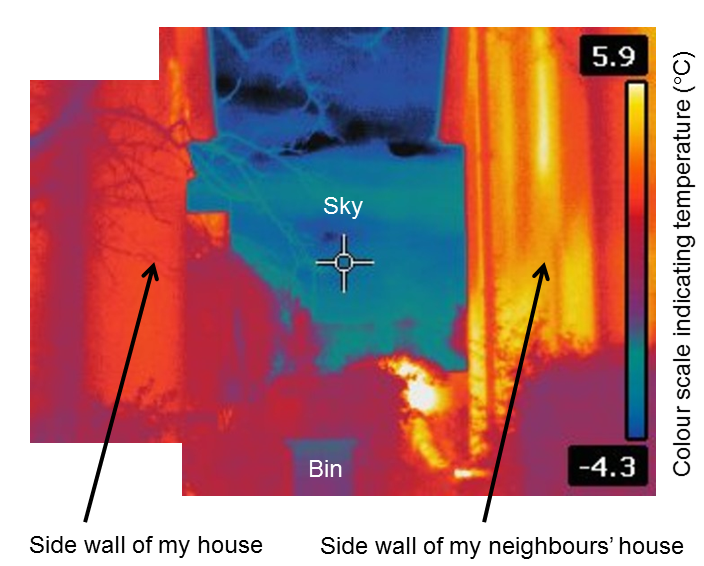 Most people don’t notice it in daylight, because the bricks are a good match in colour, but you can see its effect in a thermal image (Figure 4) comparing my house with my neighbours’ on a cold day last winter. The side-wall of my house (on the left) is much colder than theirs, because less heat is leaking through it. The new wall has reduced the gas consumption by more than a third (it’s the downward step after 2010 in the graph). The thermal conductivity of the insulating material (solid foam polyisocyanurate, or PIR) is 0.023 W m-1 °C-1. Hence a layer of thickness 190 mm has a u-value of 0.023/0.19=0.12 W m-2 °C-1, so for instance if the difference between the temperature inside and outside the house is 10 degC, the heat flux through the insulator is 1.2 W m-2. I don’t exactly know the thermal conductivity for the old bricks, but it’s probably over ten times greater than for PIR. 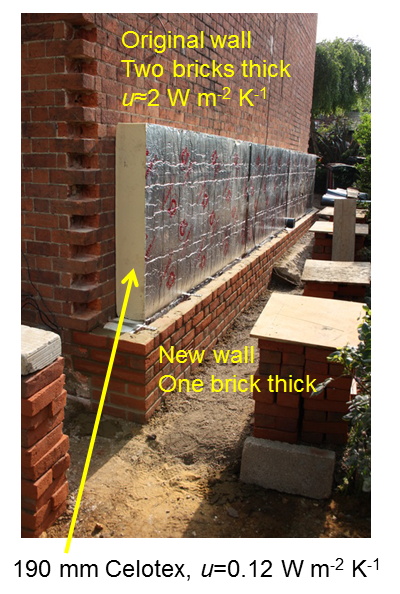 It’s generally assumed that a traditional solid brick wall, two bricks or nine inches thick, has u of about 2 W m-2 °C-1. Thus, with the addition of the insulator, the side-wall of the house conducts between ten and twenty times less heat than before. SuperHomes are old houses which have been refurbished by their present owners to reduce their carbon dioxide emissions by at least 60%. The SuperHomes scheme has a register of over 200 such properties. The aim of the scheme is to provide information about refurbishment for energy efficiency, through holding open days in SuperHomes each September. In August 2012, my house qualified as a SuperHome, but there’s still plenty more to be done! This entry was posted in Climate, Greenhouse gases and tagged domestic CO2 emission. Bookmark the permalink.